Exit policy – I wasn’t going to lie this time! I decided that when crossing Allenby Bridge into Jordan for my flight back to the UK, if the Israeli border police asked me any questions, my reply was going to be, ‘I have been teaching English in Ramallah, is this a problem’? These last three months had again made me examine my fears and, and combined with Snowden’s whistle-blowing on the National Security Agency in the US, convinced me tha t- to be truly human, to dispense with spying, surveillance and fear of the ‘other’ – we have to be open, transparent and honest. The 40 minute drive to the Bridge from Ramallah was so pleasant. The driver was a man I know who is from Aboud, a village close to Nabi Saleh, He took me by the back roads, pointing out villages I had never seen as we descended into the sandscape of the Jordan Valley. To get to the actual border crossing one has to change from the Palestinian taxi into an Israeli taxi and pay another £10 for a 10 minute ride. This Israeli driver was distinctly different…was it because I shook hands with the Palestinian driver? ‘Did I have a visa’? ‘Where had I been’? he repeatedly interrogated. We passed through a checkpoint where I was asked if I had any weapons – this is a ‘usual’ question and, luckily, we quickly weren’t delayed getting to the terminal. After I had paid my exit tax, I turned around and was approached by a giantess of a woman, with clipboard, who asked me if I was a tourist. I just looked blankly at her and she repeated her question. Still getting no answer from me she explained that, as I had just come from Israel and she came from Ministry of Tourism, she would just like to ask me some questions. Protesting that I was in a hurry, I rushed off to the next booth for an exit visa stamp. Here the official explained that my visa had expired by one day but that was not a problem .. (I have become orientated to being on Palestinian time but, even so, being 24 hours late is stretching that somewhat). And so I passed into Jordan, thinking “was that giantess really from the Shin Bet security organisation, doing a soft approach, or was it just my paranoid reaction”? I realised that I had just passed up my opportunity of being honest and transparent …I should have said, ‘No I haven’t come from Israel but the West Bank, there’s lots of tourism there in spite of being occupied’ ! The best intentions of mice and men, I have to count this as a trial run! Many Palestinians feel trapped as they don’t have the freedom to travel freely in their own state – to Gaza or Jerusalem – let alone the ‘outside’ as they frequently describe it. Some who have been in prison say they felt freer there than living in the West Bank. Here are two examples of border hassle for West Bank Palestinians who I know, minor compared to outright rejection of a visa application, but illustrating how the occupation can harass and intimidate. Ziad, Director of Al Bireh Municipality where I had been volunteering, went to Jordan for two days, and on his return he was questioned for 4 hours at the Allenby crossing by Shin Bet because he had made a speech in Ramallah about Hugo Chavez. Ramallah/al Bireh had decided to name a street after Chavez and Ziad was inaugurating this. Apart from the harassment, how did they know what he had been doing? It doesn’t take too much analysis to work that out ….The second example is that of the two teachers who give me Arabic lessons. They decided to go to Sheik al Sharm resort area in Egypt for a week’s holiday. Not being able to go through Gaza (where they were born), they were forced to travel to Amman, Jordan, and then fly to Egypt. It would be so much easier for them to go across the Rafah border directly into Egypt, if only they could. But as Palestinians this is forbidden to them. As a UK citizen, I am a privileged person, with rights and freedom to travel to countries the Britain once colonised or controlled. And I just hope that we can do something to help Palestinians get their freedom, their human rights, and the right to travel. 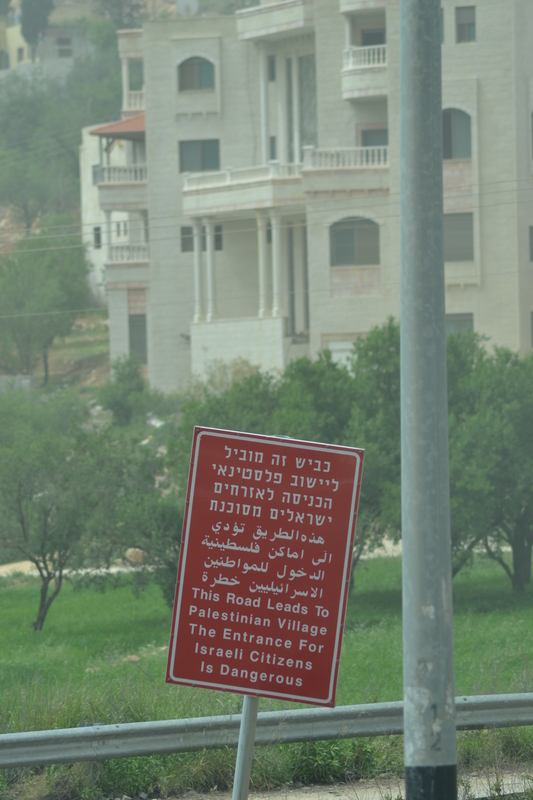 As I travel in a ‘Servis’ (7-seater mini bus), from Ramallah to Nablus, I notice the proliferation of new road signs at the road side entrances to Palestinian villages. They remind me of zoo warning signs for dangerous animals! No need to put similar signs in front of settlements – they are well protected from ‘intruders’ by high wire fences and patrolling armed security staff. Palestinians are only allowed to enter settlements if they have a work permit. Settlers, on the other hand, are free to roam Palestinian land at will, even to attack farmers and uproot trees. How could I get it so wrong? In my last post I said that Tommy Donnellen had been hit by a gas canister. I’ve seen enough wounds by now that I should know the wound was from a steel coated rubber bullet. 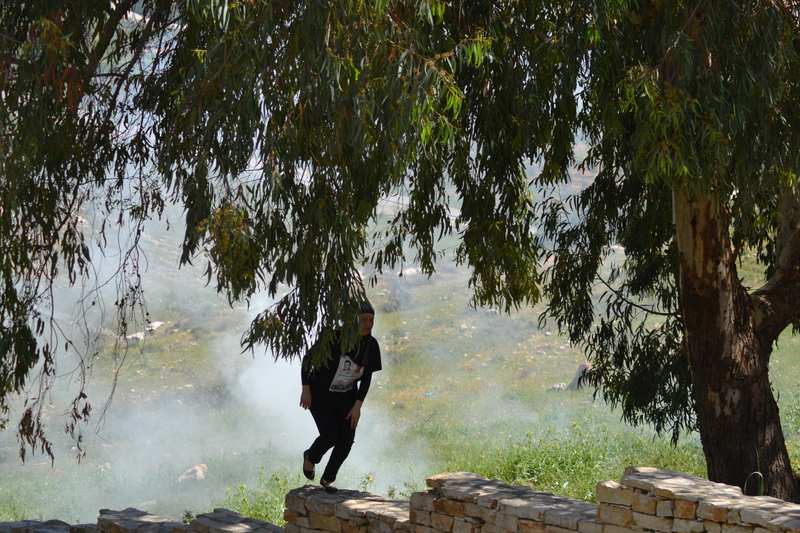 He was standing behind the wall of the petrol station, where I often stand with other photographers, professional and amateur, to snap the interplay between the boy stone throwers (‘shebab’) – and the occupation forces. There were no medics around last Friday so Anne, a French photographer, and I were trying to get some ice on the wound, but he was stoically holding out! Tommy is a relentless activist from Galway Ireland who who has been documenting Palestinian non-violent resistance* for a few years, Maybe that was why he was targeted. I hope that he is healing. Did a truce ever exist? As I write this, Gaza is being bombarded by Israeli air strikes. In the villages surrounding Ramalla land confiscation goes on for military expansion. * Friday protests are always essentially non-violent. Peaceful marches are halted by the Israeli occupation forces using skunk water and tear gas, then as the march breaks up teenages (‘shebab’) throw stones at the soldiers, who respond with more tear gas and rubber bullets. My return to Palestine 30th March 2013, Good Friday! 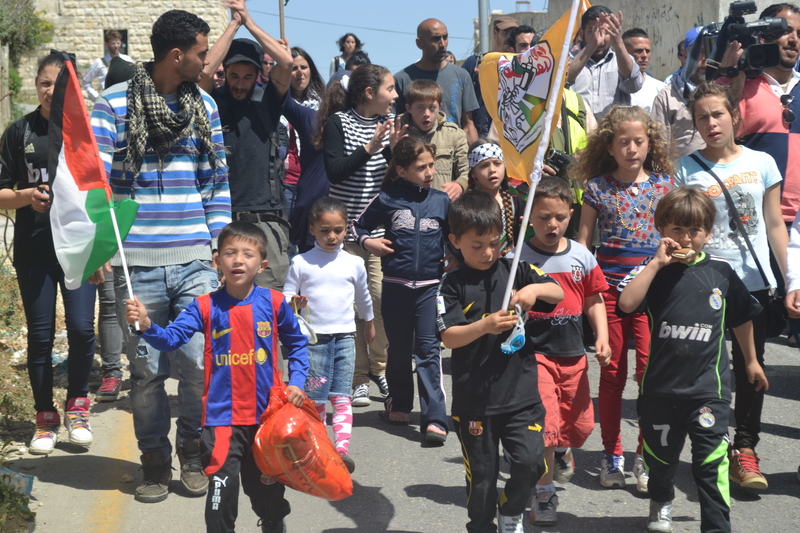 ‘Eat, eat, you are in Nabi Saleh!,’ says Boshra. ‘I have just rocked up from Ramallah on the servis.’ She is not expecting me but after hugs, kisses and tears (on my part) she has prepared brunch and tells me about her recent speaking tour in France. Arranged by the French equivalent of Palestine Solidarity Campaign, she, Manal, and Nariman spent 22 days travelling and giving talks about resistance and Palestinian women . It has been a resounding success and has empowered Boshra no end – when I left last December her energy seemed quite low. 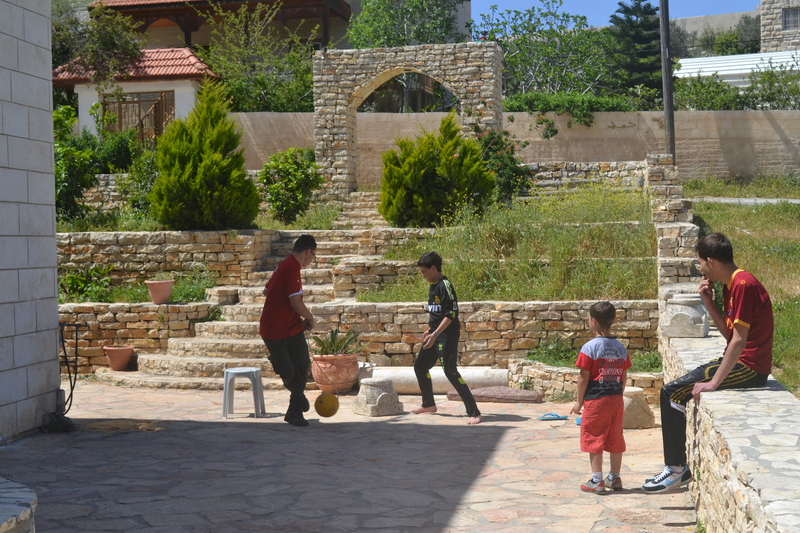 Outside the boys kick a ball around as they do before and after the Friday demonstration. 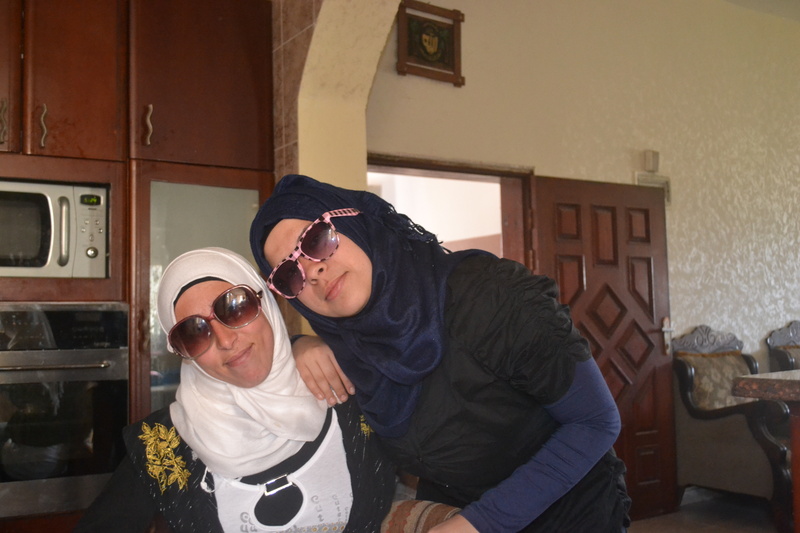 After her daughter Bezan hands me my shades I left there in December, she and friend Ola pose for a picture. The young are media savvy here, forever documenting their lives and using Facebook. The small close knit village of 500 Tamimis, has resisted the occupation since 2009 after the theft of their village spring by the settlement of Halamish. Halamiksh was built from 1977 onwards on stolen Nabi Saleh land. Unique because three of the community leaders are the women I mentioned before and the children are in the forefront of the start of the Friday march. At one time the children were not included but as Manal says they decided to teach them not to be afraid. She herself was beaten and arrested in 2009 in front of her three year old. “We had to break this wall of fear in our kids to be able to continue the struggle in the future,” she stated in an interview. Her husband Bilal says ‘the resistance is for our kids future, so they can grow up and follow their dreams and their kids too’. The only injury was to Tommy Donnellen, filming from the petrol station and shot at twice. 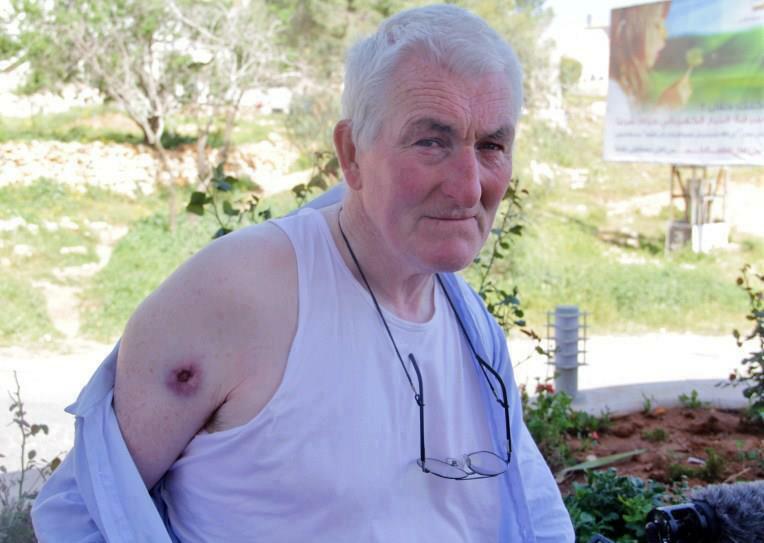 As reported in the Belfast Telegraph, a tear gas canister punctured his upper right arm. I read the press report and the only discrepancy I can find is that they reported they he tried to reason with the soldiers, but he told me he shouted you motherf**cker, lost in Irish translation? I find being in Nabi, especially with the women, inspirational. I believe we all learn from each other and the lessons about me, me, me I have learnt from these women are boundless. To return to another pop song, as I do shamelessly, – Hope by Emeli Sande, one for las Passionaras? Thank you Nabi Saleh, especially Boshra, Nariman and Manal. The jubilant celebrations that I witnessed in Palestine when the UN General Assembly voted for an observer state status are in direct conflict with the grim reality on the ground. All non-violent demonstrations that resist the occupation of Palestine are deemed illegal and suppressed by the Israeli Defence Force (IDF) – relabelled to reflect its real role as the Israeli Occupation Force (IOF). Any place where a demonstration takes place – village, street or field can be decreed a Closed Military Zone and demonstrators attacked using an array of deterrents: skunk water, tear gas, rubber coated steel bullets, live ammunition and arrests. In Nabi Saleh when I was there my friend’s brother, sitting on the hill overlooking the village spring ‘stolen’ by the settlement Halamish, was shot and subsequently died of his wounds. 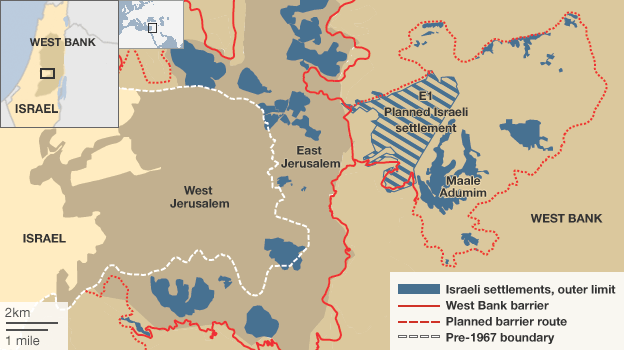 The day after the after the Palestinians obtained a limited statehood at the United Nations General Assembly, the Israeli government decided “to punish” them by tripling its illegal settlement building. Plans for building in E1 zone (see below) is a ‘game-changer’, destroying any chances of a viable Palestinian state with Jerusalem as its capital. 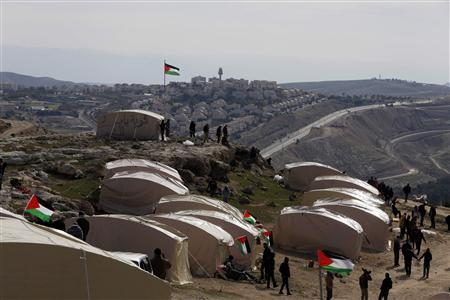 Last Friday, Facebook and Twitter were on fire with news of a tent village, optimistically called Bab AlShams, the Gate of the Sun, secretly erected in E1 but on private, Palestine land next to a Bedouin encampment. Carefully planned with about 250 demonstrators coming from all over the West Bank, braving the bitter cold, the village was equipped with a medical tent, wifi hotspot, embedded international news outlets, kitchen, library and rubbish collection. One leader called it ‘constructive resistance’.. The village lasted two days, Eviction was temporarily halted when lawyers obtained an injunction from the High Court of Justice. Netanyahu demanded that this should be overturned, the Ministry of Justice claiming: “There is an urgent security need to evacuate the area of the people and tents,” suggesting without evidence that a few hundred unarmed activists presented a grave threat to public safety. This action illustrates Israeli racist policies: there are 120 illegal outposts (embryonic settlements) in the West Bank, which are never dismantled but are allowed to gradually expand before being eventually declared ‘legal’ by the Israeli state. A New Model for Non-Violent Protest? The camp was evicted by about 500 occupation soldiers. Protesters refusing to leave were assaulted, six needing hospitalization. Mohammed Khatib of the Popular Struggle Coordination Committee said: ‘ We will not remain silent as Israel continues to build Jewish-only colonies on our land. Bab Al Shams is no more, but during its short two days it gave new life and energy to all who passed through it. In establishing Bal Al Shams we declare that we have had enough of demanding our rights from the occupier – from now on we shall seize them ourselves’. As the USA and the EU sit idly by, it is up to the Palestinian grass roots movement to stand up for justice again – is this the start of the 3rd Intifada?